I know the recycling ideas are just so crazy. Sometimes you do just some mean stuff, and sometimes it gets so weird that it could become a mere laughing stock for you. 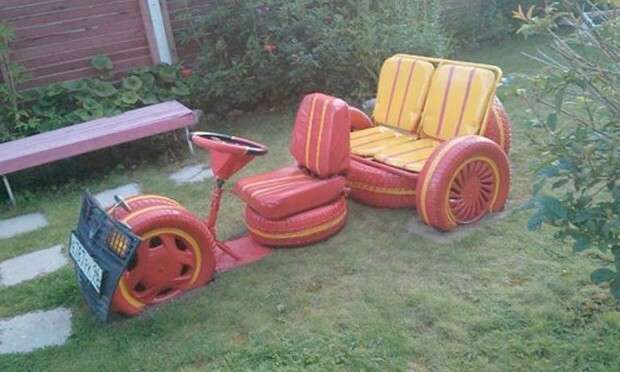 We have recycled so many crazy things, especially the tyres are the most frequented item. 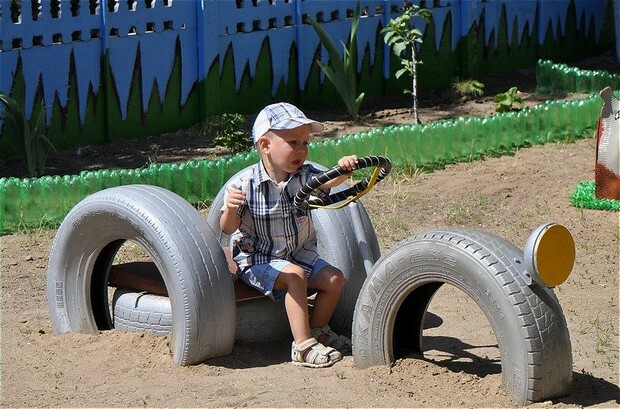 We have made numerous art crafts using the mega tires. 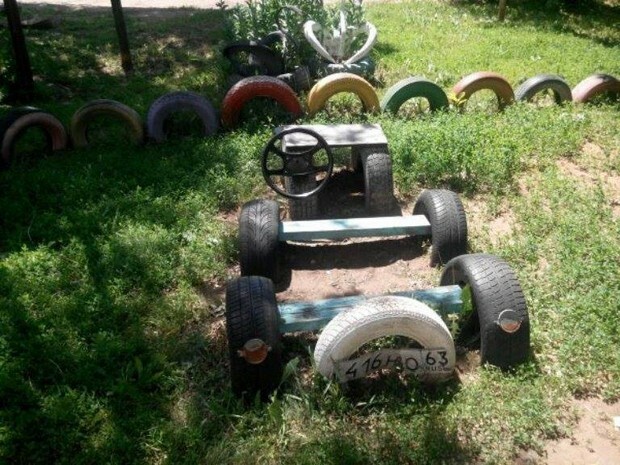 Some pals just decided to trash out their used tires, but we have always been the ones who preferred to make the nest use out of the old tires and have turned them into something more practical and useful. 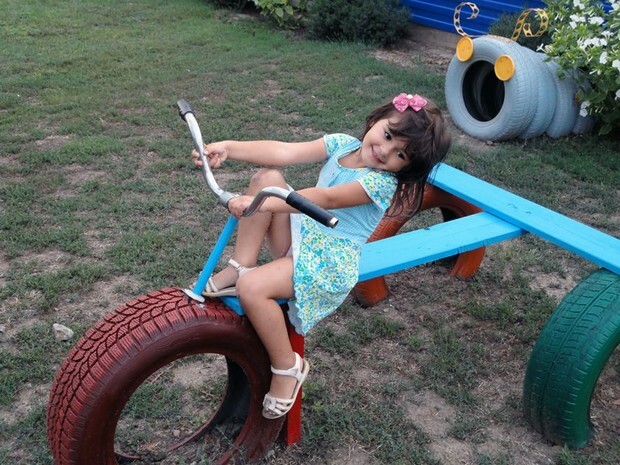 This time we are going to turn them into kids play and fun providing stuff with recycled tires. 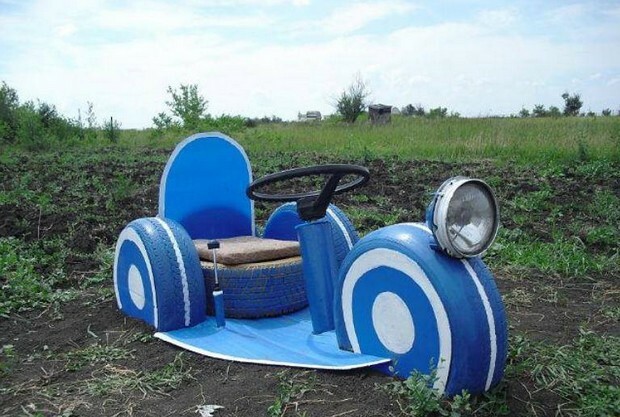 The very first item made with the old tires is a big vehicle that farmers use in their fields, called tractor. And we are going to use this tractor for the kids fun activities. The big used tires are dug deep inside the land, and a wooden seat is erected above them shaping them like a tractor. And this new bike experience would be great for the kids I think. 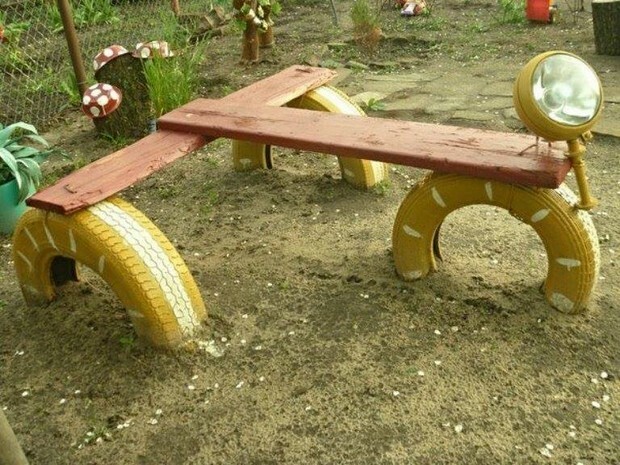 This is basically a simple bench made using the wood and the old tires, but the way it is shaped would be more exciting for the little fellows. 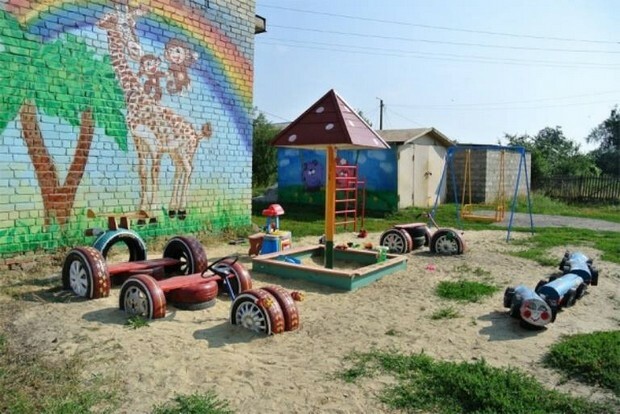 If you want to make a whole large kids play area in your town, collect a pile of the old tires that you have removed from your big vehicles because you had to change them. Make these different kids play rides and swings. 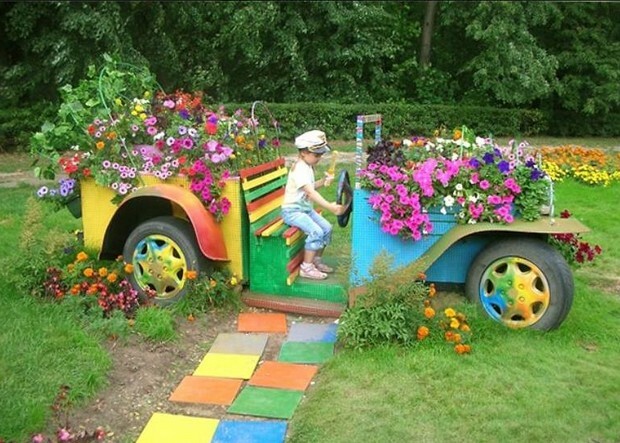 Wow, look at this beautiful lorry all stuffed with your favorite colorful annuals, it has got all the range in colors. 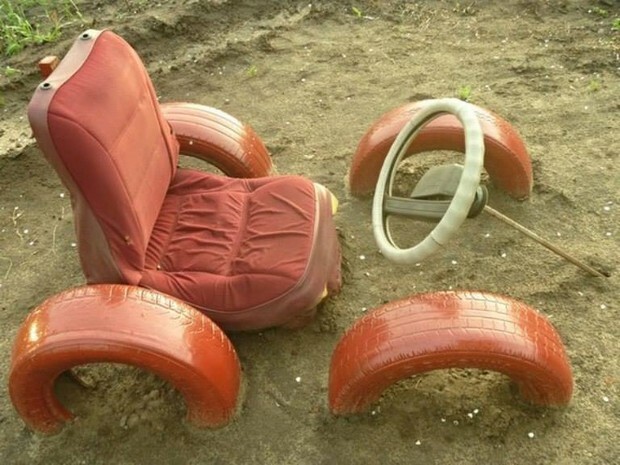 And this time the tires along with the rims are put to task making this beautiful garden décor idea. 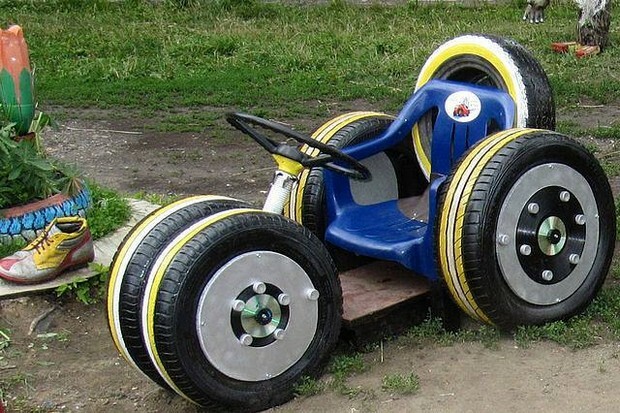 Tires made with a certain synthetic material are pretty hard an d rough to touch, make sure that you have finished them with some smooth and fine stain so that they just become smooth to touch as these projects are meant to be made for the kids fun time. With every next tire recycling project we are moving towards more systematic and well planned project just like this one. 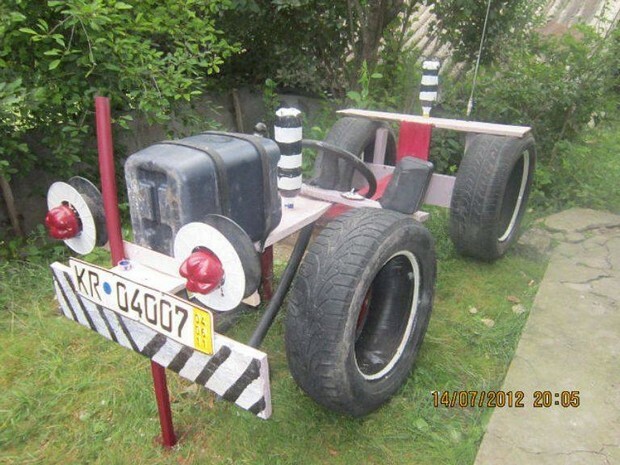 This vintage car made using different materials like a plastic old chair, wood and tires along with the metallic alloy rims. We have painted the tires to give them a perfect shape with charming colors. The best thing that can be used to finish the old tires in recycling some kids play and fun projects is the high quality stain. This would do a couple of good things like making them look more attractive for the kids, plus it would also enhance their possible useful life as well. 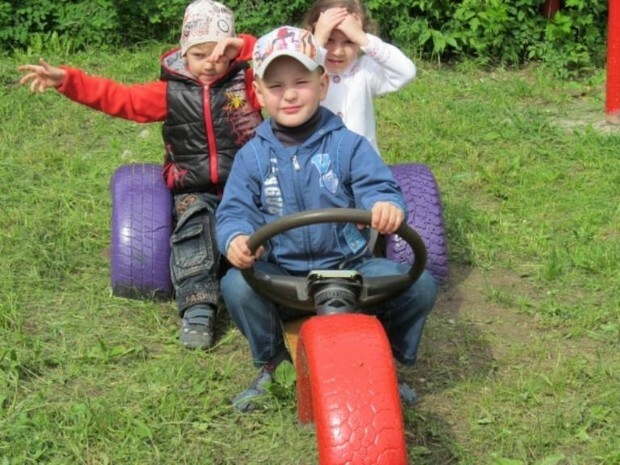 To give these kids fun projects a perfect shape you can use some reclaimed supporting accessories like a front light and a metallic wheel as a steering. Though the tires could have been used in a simpler and straighter shape, but this pattern is going to be more exciting for them.